This editorial appeared in the Pioneer Press and is reposted with permission. As nonpartisan election integrity advocates with front-row seats at the U.S. Senate recount, we believe Minnesotans can be confident the process has been methodical and fair. The intense scrutiny given to each step of the process and to each vote in the Senate recount has provided an incredible civics lesson for Minnesotans and the nation. Hundreds of Minnesotans have volunteered as nonpartisan observers in at least one of four statewide manual counts � the 2006 and 2008 post-election audits, the 2008 judicial primary recount and, now, the U.S. Senate recount. These efforts were organized by Citizens for Election Integrity Minnesota in partnership with the League of Women Voters Minnesota and Common Cause Minnesota. Our volunteers who were trained to be impartial observers signed a code of conduct and completed observation surveys. According to one observer, "After my first day I felt proud that our process was so transparent in Minnesota and confident that our election could not be stolen by one party or another because we had such a good recount process." Our current election laws effectively prevented the chaos that could have clouded the process. This article was posted at Ed Felten's Freedom-to-Tinker Blog and is reposted here with permission. Minnesota election officials are hand-counting millions of ballots, as they perform a full recount in the ultra-close Senate race between Norm Coleman and Al Franken. Minnesota Public Radio offers a fascinating gallery of ballots that generated disputes about voter intent. 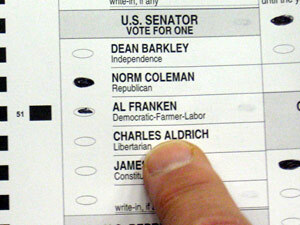 A scanning machine would see the Coleman and Franken bubbles both filled, and call this ballot an overvote. 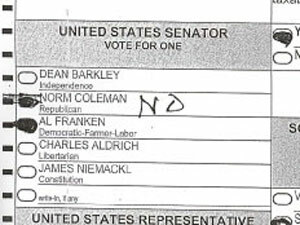 But this might be a Franken vote, if the voter filled in both slots by mistake, then wrote "No" next to Coleman's name. Do we call this an overvote, because two bubbles are filled? Or do we give the vote to Coleman, because his bubble was filled in more completely? This article appeared at ProPublica. Unlike many states, Minnesota has a solid idea of how well its machines scan ballots because it randomly audits samples of votes. One test found only one error out of 12,000 ballots. Another turned up as many as 53 "discrepancies" -- between a machine's and a human's read -- out of 94,000. That's impressively accurate for voting machines. But it's not precise enough to predict who'll triumph in the U.S. Senate race between Republican Sen. Norm Coleman and Democrat Al Franken. They're currently separated by 206 votes out of 2.9 million cast. Coleman's unofficial lead amounts to .007 percent of the vote, easily triggering Minnesota's required recount of any race closer than .5 percent. In a few days, election workers will begin scrutinizing every single ballot cast in the race. Minnesota uses optical scan ballots -- fill in the bubble -- so hanging chads are not an issue. The outcome has national stakes, as a Franken victory would move Democrats closer to a 60-vote super-majority in the Senate. For those interested in election reform, the recount promises added drama. The pros know that no voting system designed, used and overseen by humans can be perfect. Voters may not follow directions. Machines can misread stray marks or just break. Workers typing up machine results can leave off the "1" in "124" (that mistake got caught last week in Minnesota). Minnesota, however, has gotten unusually high marks from experts for its record of election oversight. That record, nonpartisan watchdogs say, stems largely from practices that other states could import. The recount will test how well Minnesota's procedures hold up under the closest scrutiny. Minnesota continues to improve its election transparency and accountability standards with passage of an innovative law allowing losing candidates to call for manual recounts in select precincts. Called the �partial discretionary recount,� the law believed to be the first of its kind in the nation, is a cost-effective way for candidates to have the election results in specific precincts verified. The law expands on provisions of Minnesota�s recount law which provides for recounts in races within a margin of victory of 0.5%. Under the new added provision, candidates in any contest with a 5% margin of victory may call for a hand recount, at their expense, of up to three precincts. If the requested recount shows a difference greater than 0.5% compared to the Election Day results, there will be hand recounting of additional precincts. That could lead to a contest-wide recount if more disparities between the reported results and the hand counts are discovered. The requesting candidate is responsible for the initial recount expenses � unless the outcome of the race is changed by the recount. In that case, the election body that has jurisdiction over the miscounted ballots will be liable for associated costs (which is generally staff time). The financial burden often deters candidates from seeking a recount. This bill makes recounts more accessible. The bill was passed unanimously by both the Minnesota House and Senate and was signed into law Saturday, May 17, by Gov. Tim Pawlenty. Ohio Secretary of State Jennifer Brunner is concerned that computers used to count ballots at precincts are vulnerable to hacking. In a major report released last Friday, she recommends instead counting ballots centrally at Ohio's 88 county boards of election. Whatever the risk of hacking, however, it is a mistake to eliminate the counting of ballots at local precincts. Ballots have been known to go missing during transport from precinct to main office. In the old days, ballot boxes sometimes would end up in the river. In 2006, during the much-troubled May primary in Cuyahoga County, election officials misplaced 70 cartridges containing the votes from 200 precincts. A better way to address Brunner's concern would be to count ballots twice, first at the precincts and then again after they've arrived at headquarters. That way, if ballots were lost en route, voters would not be disenfranchised. The general point is that we should rely on recounts, or audits, to address our concerns about potential counting errors, including those caused by software sabotage. There are different types of recounts, machine and manual, as well as different types of audits. A mandatory audit of 10 percent of precincts, no matter how close the margin of victory, is obviously stricter than an initial audit of only 3 percent of precincts unless the result is close enough to require a more rigorous review. Given the concerns raised by Brunner's report, as well as the potential significance of Ohio to the 2008 presidential election, it would be appropriate to plan an especially rigorous audit of next November's election. Citizens for Election Integrity Minnesota (CEIMN) have released their report and analysis of Minnesota's first post election audit. The purpose of the audit was to assess the accuracy of the state's optical scan voting machines. Working with the League of Women Voters Minnesota, CEIMN organized 208 volunteers in 70 counties to observe Minnesota's first post election audit - the nation's first statewide citizen observation of a post election audit. According to CEIMN director, Mark Halvorson, "Having a front row seat in observing the audit provided us with valuable information in the shaping of the report's recommendations, such as counting methods and how the audit data was recorded. We are convinced that post election audits are key to ensuring accurate and verifiable elections. This report will not only help improve the audit protocols in Minnesota, but will help other states as they consider similar audit legislation." Citizens for Election Integrity Minnesota is a non-profit, non-partisan organization that advocates for accurate and verifiable elections. The League of Women Voters, a non-profit, non-partisan organization, encourages informed and active participation in government and influences public plicy through education and advocacy. For more information visit www.ceimn.org. This article appeared on electionline.org and is reposted here with permission of the author. Minnesota's first-ever post-election review - a manual count of votes from randomly-selected precincts in the state - drew raves from two sides that do not always see eye-to-eye, election officials and advocacy groups. "I believe that Minnesota has done a most remarkable job at making every vote count and count correctly," said Janet Straub, a Minnesota resident and observer of the post-election review. Incoming Secretary of State Mark Ritchie (DFL) said he was also impressed. "I am excited to hear the very positive results from our first reviews. We can all feel a great deal of confidence in our election results - and only hope that other states can catch up to our system before the 2008 elections," he said in a press release from Citizens for Election Integrity Minnesota.